LOUISVILLE, Ky. (March 17, 2015) — The Greater Louisville Association of Realtors (GLAR) reported that year-to-date sales are up 6.3 percent, with 1,732 homes and condos sold versus 1,629 at the same point last year. Sales were up 0.5 percent in February 2015 (848 units) compared to February 2014 (844 units), and the average selling price in all Multiple Listing Service (MLS) areas was up 5.5 percent compared to the same month last year. The median price in Jefferson County was up 3.7 percent and the average was up 1.6 percent due to the specific mix of homes sold. For all MLS areas, the inventory of available properties remains 11 percent lower than the same month last year. 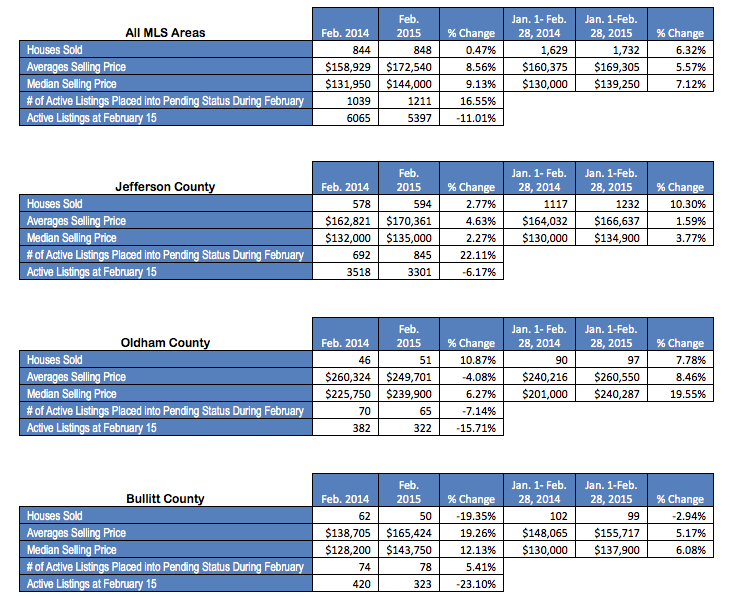 In Jefferson County, inventory is recovering slightly, but is still 6.1 percent lower than February 2014.